One of the major ways in which we learn is by watching and listening; the use of video and streaming in education embraces this and introduces the chance for improved interaction and communication on a local, national and global scale. You would possibly be surprised at just how much of a pivotal role video can play in the development and enhancement of education. Whether the subject matter is basic or advanced, the introduction of video enables an improved student experience. Imagine a history class where the intricacies and facts of a battle can be brought to life. Equally, the often exacting and complicated instruction of chemical experiments can be visualized in depth, using video as an aid. Of course, video technology is also the perfect means by which to develop the global classroom, by means of streaming one on one college education classes, or by enabling students in remote locations to access the instruction they need to complete courses and gain vital qualifications. Conversely video is an excellent means by which to take centrally located students out into the wider community, and the world, without them ever having to leave the classroom. Video isn’t just a valuable tool in the classroom it’s also an excellent enabler of teacher development as professionals can access online tutorials and advice videos to improve their teaching performance. It shouldn’t be forgotten that if you have video capability in an education environment you can utilize it for out of class activity such as screening entertainment for students in common rooms or assembly halls. Colleges have been quick to embrace the world of opportunity that opens up from the use of video technology. There are several interesting and notable examples of this. In Akron, colleges have expanded student learning opportunities with the use of video streaming technology, both by increasing study opportunities for on campus students, and by improving access for remote students. 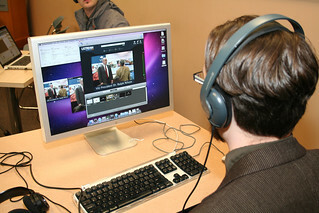 Colleges now host online video libraries where they store a selection of webcasts, recorded lectures and other appropriate material. This means that students can access vital information from any location, as long as they have access to the Internet. Philo is a service which is being trialled for use by students at the University of South Florida. It allows them to stream up to 20 hours of TV they would normally watch, through the Internet. It’s an excellent enhancement to student life allowing improved flexibility while still watching favourite content. The human mind has a natural tendency to wander. Add to this the fact that we live in an instant world where video channels such as YouTube give us access to quick entertainment experiences and you can see how small bites of video learning could be useful. Sanjay Sarma, director of digital learning at the Massachusetts Institute of Technology, insists that learning establishments should embrace video technology, and encapsulate it within their teaching procedures to provide a more modern, creative and effective learning experience. It’s not just students who can benefit from the use of video technology in teaching, but teachers too, in a financial sense. In China, teacher Zheng Renqiang saw his IELTS (International English Language Testing System) training programs being bought out by Guangzhou-based 100.com for hundreds of millions of yuan. The programmes started with Zheng Renqiang teaching students online for less than 20 hours per month, using just a camera and a headset. Now the 32-year-old can sit back and reap the benefits of his initiative as 100.com streams his teaching channel, together with its other video streaming content, to over 6 million registered students, with numbers increasing by up to 4,000 per month. For students and teachers video streaming technology opens up a whole new set of opportunities with an expansion of study locations and timelines and an increase in the online earning potential for educators.